I hope everyone had a great Thanksgiving weekend and filled up on delicious brussel sprouts, quinoa, and Tofurkey (…just me?). 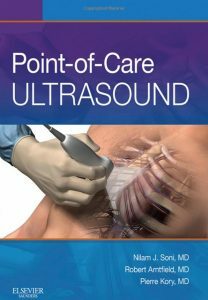 This past week has seen some seriously awesome POCUS cases, so competition for COTW/COTG was fierce! This is a sixty-something year-old gentleman admitted for symptomatic bradycardia. He subsequently developed respiratory failure – enter team POCUS. What do you make of his thoracic scan? Any surprises? This is a middle-aged woman initially admitted to the unit with profound hypoxemic respiratory failure, who became quite hemodynamically unstable requiring multiple pressors. What do these clips tell us about the etiology of her shock? Feast your eyes on the TAPSE tracing of this superpowered right ventricle. 1) If pneumothorax is a principle point of concern, it’s worth it to optimize your scan for pleural motion. 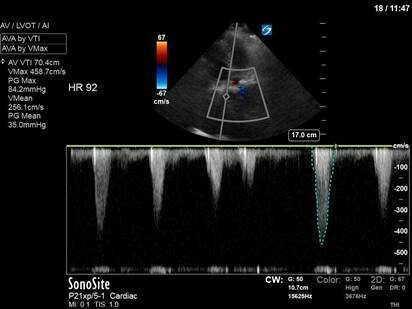 You can do this with probe selection – the linear (high-frequency) probe gives the best pleural visualization; followed by the curvilinear probe; followed by the phased-array (used here). It’s also often a good idea to take a dedicated “pleura” clip with significantly decreased depth and gain – both will allow you to optimally visualize pleural motion. 2) In this clip, although lung sliding is not evident, we do see a lung pulse. A lung pulse is rhythmic cardiac activity that is transmitted to the pleural surface, and rules out pneumothorax (even in the absence of lung sliding). 3) We know that the absence of lung sliding does not rule in a pneumothorax (only the definite visualization of a lung point does), as many things can lead to decreased or absent lung sliding. This case is an example of how we as clinicians can do this iatrogenically. Very high levels of PEEP – this patient had a PEEP of 24 – will cause decreased or absent lung sliding, by the same mechanism as hyperexpansion in severe COPD. Attached is an interesting little paper by a group who tested this theory by subjecting patients to stepwise increases in PEEP and noting where lung sliding was abolished. It’s something worthwhile to keep in mind when scanning any patient on high ventilator settings. 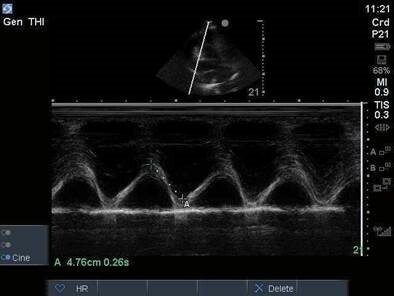 These are the kind of cases where a hemodynamic assessment with basic spectral doppler is invaluable in teasing out signal from noise. 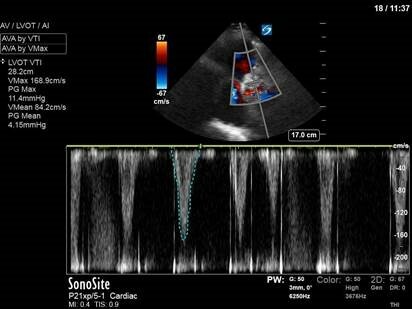 As you probably noticed from the PLAX clip, this patient had a heavily calcified aortic valve and a history of severe aortic stenosis, with previous peak and mean gradients documented around 80 and 40, respectively. 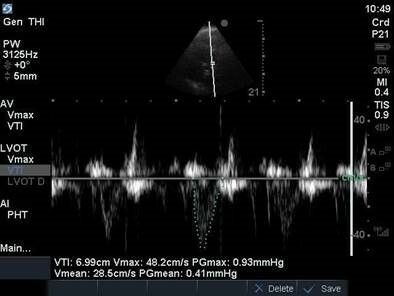 Image 3 confirms this finding, as a CW placed just past the aortic valve reveals an aortic Vmax of 4.6m/s with a mean PG of 35mmHg. Obviously, then, her ongoing shock is cardiac in nature secondary to her severe AS – right? We can clearly see that cardiac output is NOT the problem here. Despite her severe AS, her heart has successfully compensated to maintain CO (as is often the case in chronic problems). This is not cardiogenic shock. So if CO is high, but BP remains low, we must be dealing with a low SVR. In this case, the patient had severe vasoplegia in the setting of septic shock. Vasopressors were uptitrated and she received ongoing therapy for her severe sepsis. That’s it for this week. Happy scanning!